On Wednesday, January 25, a team of 150 officers from the State Investigation and Protection Agency of Bosnia-Herzegovina (SIPA) arrested Nusret Imamović, leader of the main Wahhabi Islamist cell in the country, and his brother Eldin Imamović. The pair was seized in an investigation of a gunfire attack at the U.S. Embassy in Sarajevo last October, by a Serbian Muslim named Mevlid Jašarević. According to Bosnian media, SIPA announced, "The goal of the operation is to collect evidence that could be tied to the attack on the U.S. Embassy and all the evidence will be handed over to the Bosnia-Herzegovina State Prosecutor after forensic processing." 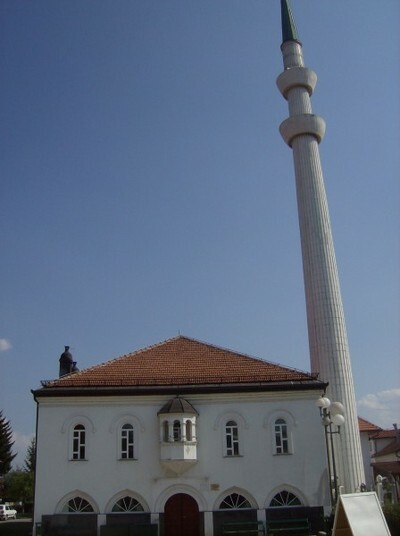 Sultan Ahmed Mosque, 17th c. CE, Bugojno – The mosque was heavily damaged during the 1992-95 aggression and was reconstructed with some modern alterations, including to its minaret. Photograph 2010 via Wikimedia Commons. Nusret and Eldin Imamović were apprehended in the northeast Bosnian village of Gornja Maoča, an enclave considered Wahhabi headquarters in the partitioned state. Gornja Maoča was raided by Bosnian police in February 2010, and Imamović was detained with seven followers. In that instance, the Wahhabi cohort in Gornja Maoča was charged with "maintaining a criminal organization, attacking the Bosnian constitutional order, endangering national unity, fomenting racial and religious hatred, discord and intolerance, and unauthorized possession of weapons and explosive materials." But Imamović and his associates were then released without trial. In the U.S. Embassy fusillade, Bosnian authorities said the gunman Jašarević had been sheltered in Gornja Maoča before he went to Sarajevo for his unsuccessful jihadist action. Jašarević remains in jail awaiting trial. As illustrated by the arrest-release-rearrest record of Nusret Imamović, Bosnian authorities had pursued a strategy of trying to confine the Wahhabi agitators to remote locations, rather than settling the problem by consequential legal proceedings. Few Wahhabis are born in the Balkans. Most long-term adherents to the extremist ideology in Bosnia-Herzegovina were foreign "mujahideen" who came to the country during the 1992-95 war. Although their contribution to the country's defense against Serbian aggression was slight, some were allowed to remain after imposition of a divided state by the Dayton Accords of 1995. More recently, however, a second Wahhabi wave has swept across Bosnia-Herzegovina, Macedonia, Kosova, Montenegro, and southern Serbia. Albanian Muslims in the region have been notably less tolerant to the interlopers, who had no role in the 1998-99 NATO-backed separation of Kosova from Serbia. Supporters of the Turkish "soft" Islamist regime of Recep Tayyip Erdoğan, imbued with the fantasy of resurrecting Ottoman imperial influence in the Balkans, have lately exercised a radicalizing influence, backed by generous financing. This effort has even become visible among Balkan Muslims living in the United States. The attack on the U.S. Embassy was an apparent turning point for Bosnia-Herzegovina. Prominent Bosnian Muslim intellectuals denounced the Islamic authorities in Sarajevo for their toleration of the radicals. Nusret Imamović has denied supporting terrorist actions. But in a brief entry on Imamović's Islamist website, putvjernika.com, the day of his latest arrest, a blogger signing only as "Sestra" (sister), said the police action "was a search for a DVD with the alleged testament of Jašarević" before he journeyed to the capital, automatic weapon in hand. The site's Bosnian name means "path of believers", and its entries are scattered with flashing al Qaeda banners. When the embassy assault occurred, one of the most prolific and provocative contributors to puvjernika.com, Abu Kudame, referred to Jašarević under an alias as "our brother Abdurrahman," and called the American diplomatic facility "the embassy of American unbelief and terrorism." With frenzied insults against Sufis, Shia Muslims, the traditional moderate Sunni Muslim creed, Israel, the pope, and democratic voting, Abu Kudame accused the Bosnian secular and Islamic authorities of "generously and eagerly cooperating with the unbelievers." Having re-arrested Nusret Imamović, one hopes the Bosnian authorities will handle the case better this time, neutralizing the radical network in Gornja Maoča for good and helping put a definitive end to terrorist incitement in their country. 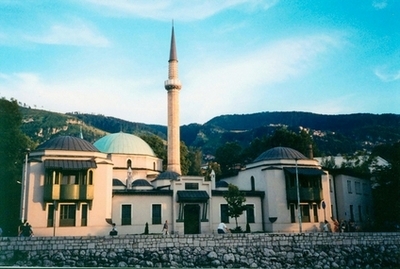 The sublime 15th c. CE Careva (Imperial or Sultan's) Mosque, Sarajevo, in a 2004 photograph.